One of my favorite aspects of May is that there are “new” birds every day. Constant turnover as the flow of migratory songbirds, especially the long-distance Neotropical migrants, reaches its peak means “first-of-years” can be found almost every day. Even better, is the constant turnover and new arrivals almost anywhere we go birding. With an exceptionally busy week, my birding time was limited to the early mornings, but Florida Lake did not let me down. In fact, it was a lot of fun. With good diversity each day, and new birds arriving each night, there was always something new to look at. And, as is the case with loyal patch-working, the consistency of visitation makes for a nice education on the ebbs and flows of seasonal migrants. Check out the scorecard of warblers (and a few other personal first-of-years) that I had each day this week, and note the subtle change in diversity and species dominance as the season advances. Numbers of individuals have not been huge, but numbers of species have been great for the second week of May. 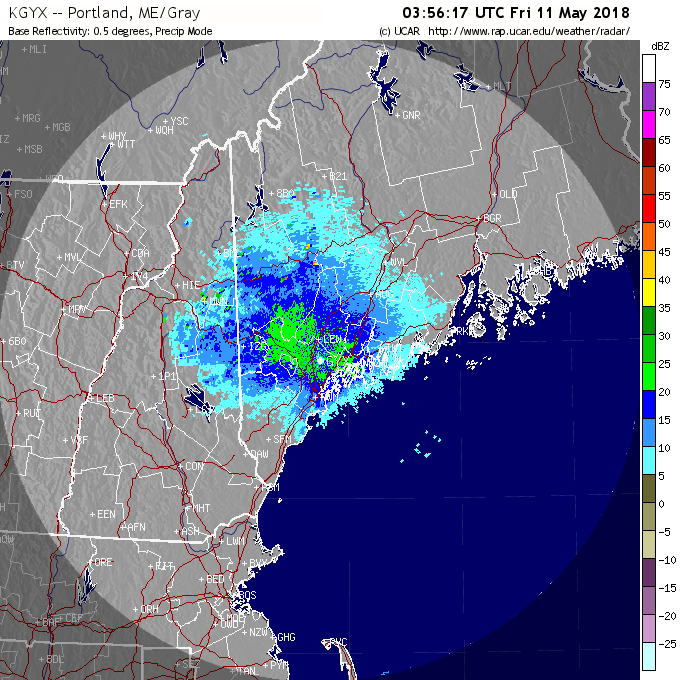 Ambiguous radar due to presence of fog that moved inland overnight, but looked good for birds, too, and possibly large flight inland. 52F, partly cloudy, moderate NW. Dry cold front passed overnight with SW to S winds shifting to W to NW by 3:00am. Very strong flight early in overnight diminished rapidly after midnight. And these radar images from midnight showed that it was going to be a great day! Folks in Portland have been rewarded with daily visits to Evergreen Cemetery and/or Capisic Pond Park, while those closer to Biddeford have headed to Timber Point, for example. But regardless of where you are, there’s a local “patch” to be “worked,” or perhaps to be discovered. And there’s no better time than now! This entry was posted in Birding in Maine and tagged "Birds, Birding, Florida Lake Park, Freeport, migration, patches, warblers on May 11, 2018 by Derek.